Well, Christmas came in with a thud at our house. Quite literally. 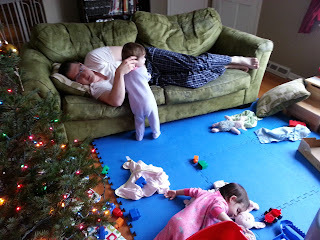 Christmas morning, I woke up to a loud noise coming from the bathroom, and found Sean passed out on the floor again. Poor guy had the stomach flu, and it completely laid him out. And that pretty much describes our entire week. Our entire--very long--week. Ellie started to come down with flu-like symptoms the Thursday before Christmas, but we thought she ate something that didn't agree with her since her symptoms were really low-key. So we continued on with our plans. By Sunday, Caleb and I were both sick as well, and that's when we knew. The stomach flu had hit our house. I have never been so grateful that Sean's vacation coincided with an illness. I spent Sunday evening/night in bed trying not to repeatedly throw up while Sean ran interference with Caleb and Ellie. Monday, Abby got sick, and Tuesday, Sean got sick. This was such a nasty bug. It literally has taken each of us 4-5 days to fully recover. The symptoms hung on like we were the last human hosts available in Kansas City. Ugh! Due to us having the stomach flu, we cancelled all of our Christmas day plans to see our families. Instead, Sean's parents decided to brave the illness (their idea, not ours!) and come over on Christmas Eve with gifts for the kids. The kids thought it was awesome! Abby and their peg toy. Ellie has been playing with this non-stop! Ellie thought my new bud vase was an awesome cup. It's now up on a shelf where she can't break it. But honestly, the wagon was (and still is!) the highlight of the evening. Caleb thought it made a great seat! We were happy that we got to see them because Christmas Day was extremely low key. Mostly, we all just laid around and groaned all day. I felt so bad for Sean. He spent most of the day throwing up or sleeping. When he gets sick, it's exacerbates his heart condition, which makes him pass out, which makes him more sick, etc. He just can't get ahead. It was after lunch before we finally gave the kids the gifts we picked out for them at the fall consignment sales. It was so fun to see them actually rip wrapping paper this year! Last year they were too young. My favorite gift for the kids: $8.00 Little Tykes Table and Chairs! Consignment sales are totally the way to go! So while our Christmas certainly wasn't ideal (I didn't get to eat my orange danish rolls), I couldn't help but be grateful that we were all together for it. So many families are missing loved ones this Christmas season, and I certainly don't take having my family...sickness and all...for granted. Without fail, God has provided for and protected our family during 2012, and we praise Him for His kindness to us. There were times when we really didn't know how we would make it, but every single time, God provided what we needed when we needed it. 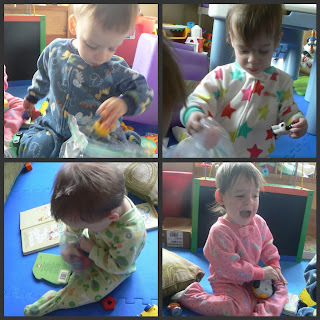 Caleb, Ellie, Abby, and Eli in their new overalls! Myself and 2 of my kids have had colds, then one threw up at McDonalds yesterday, and the other threw up at home tonight which really sucked cuz I was sitting by him and it got on my hand and I'm preggo so it was really hard for me to not make a bigger mess lol. Luckily my wonderful hubby got the mess cleaned up for me. I spent most of this week laying around exhausted and nauseous, but at least for a good reason lol. Oh no! So sorry that you have some of the crud going around. I don't think anywhere in the country is safe right now. But it's extra hard if you are pregnant and already tired and nauseous. I hope your kiddos get better soon and that your pregnancy gets a little easier from here on out!